I'll get to these charming little biscuits in a second. First I'd like to thank one of my lovely readers for letting me know that some of my food photos were being used without my knowledge or permission. Thank you so much for bringing this to my attention. I've never had to deal with this kind of situation before, and it made me a bit nauseous. Have I been too naive in thinking that photos could be used without asking? I'd hate to think so. When someone asks if they can use a photo, my camera and I are truly flattered, and I always say yes. All I ask is that they give credit where credit is due. This week's Tuesdays with Dorie recipe was chosen by Jennifer, of Cooking for Comfort. Usually I don't have very much luck with biscuits (they end up as sad little hockey pucks). But they key to perfect, flaky biscuits, is a light hand. When a recipe says not to over-mix the dough, do not over-mix the dough. I resisted the need to keep kneading, and I was rewarded with light, fluffy, happy biscuits! For the recipe, please hop on over to Jennifer's adorable blog, Cooking for Comfort. The biscuits are extremely fast and easy to put together... and they make an excellent fried egg sandwich. They are beauties. They look too light to be biscuits. Your biscuits look perfect and your photos are lovely. It's nice to have friends in the blogging world. I've made the best friends in TWD. What an amazing group of bakers. First of all, it saddens me that people use pictures without permission. I'm so sorry you have had to deal with that! Your biscuits are absolute perfection! I'm loving the blue and white paper cups-they are adorable! 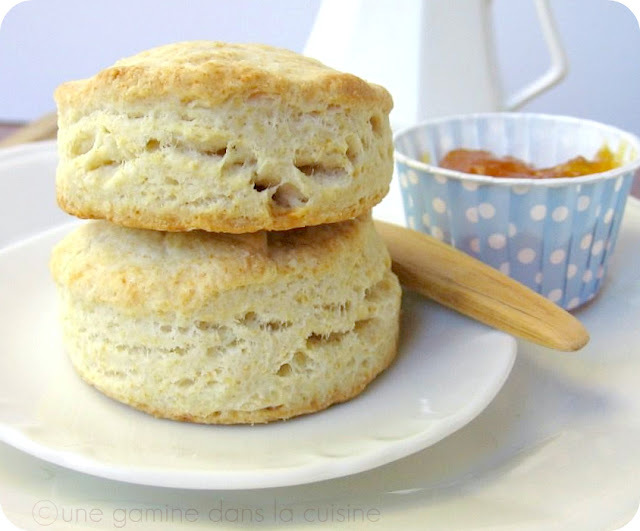 These biscuits are on my short list of recipes to try. But really, how did yours turn out so perfectly? You're making me feel overmatched before I even begin! I never even thought about someone stealing photos like that! Wow. You do have amazing photos and those biscuits look gorgeous. Yum. Great biscuits !! This was a simple recipe with an awesome outcome! The picture thing stinks..Im glad you were able to take care of the situation! You take pretty pictures! I'm still working on mastering the light, flaky biscuit. Mine are ok but not great. Yours are beautiful! Same holds true for scones. Overworking the dough over-develops the gluten and makes it hard and rubbery. Infinitely better, and easier, to go light handed! But your biscuits look perfect! Tall and beautiful. 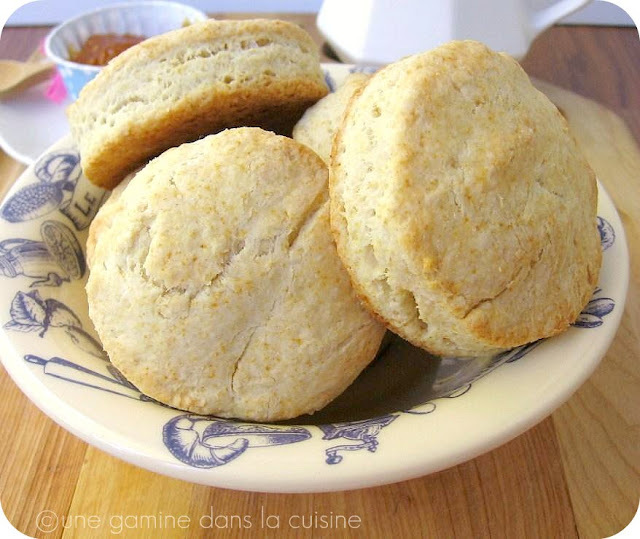 Your biscuits look puffy, golden and delicious! perfectly round and perfectly tasty i bet. I feel like the Lion in the Wizard of OZ... put 'em up! It riles me when I see a fellow blogger's work being "stolen". It's happened to me. Kudos to you, though, for letting it go. I try the nice route and ask them to either remove it, or at least link back to me. Then, I have to let it go and be flattered. There. 'Nuff said. I'm not a biscuit fan at all. However, my boys are. You certainly discovered that light hands make light biscuits. These look flaky and beautiful.